By Steve Holland WASHINGTON (Reuters) - President Bush vowed on Tuesday to prevent al Qaeda from setting up a violent, radical Islamic empire based in Iraq, which he said was Osama bin Laden's ultimate goal. Police have been given more time to question 14 men arrested in anti-terror raids in London. The Metropolitan Police were granted warrants to further detain three of the suspects until Wednesday.Scotland Yard said the remaining 11 suspects could be questioned until Friday.The arrested men, aged from 17 to 48 years, were detained in the capital at the weekend under the Terrorism Act 2000 after months of surveillance involving Scotland Yard's Anti-Terrorist branch and MI5. Armed police have arrested 14 men following anti-terror raids in London, including 12 arrests at a restaurant in the Borough area. Two people were held elsewhere in the city in what police said was an intelligence-led operation. Police said the arrests were not connected to the alleged transatlantic jet bomb plot or the 7 July attacks. 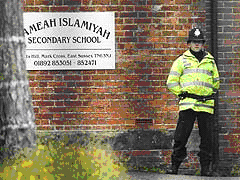 An Islamic school near Tunbridge Wells has also been searched as part of the same operation. and look forward to productive co-operation. which have similar objectives to ours. Read more: "Is the West Racist Toward Muslims and Arabs?" LONDON, Aug. 23 — Once again, with another alleged terror plot that has a possible connection to a charity, the question is being asked here, with more urgency: To what extent do Muslim charities — on the surface noble and selfless — mask movements and money for terrorists and extremist groups? Summer 2006 On October 22, 2005, the France 2 television talk show Tout le Monde en Parle aired an interview with writer Salman Rushdie and French actor and Islamist Sami Nacéri. Left on the cutting room floor was an ugly incident during taping when Nacéri accused Rushdie of debasing Islam. If an imam asked him to kill Rushdie, Nacéri went on, he would himself shoot the bullet into Rushdie's head. He then pantomimed firing a gun at Rushdie. A CHARITY at the centre of concerns over the funding of the alleged terrorist plot to attack trans-Atlantic aircraft has had its assets frozen. 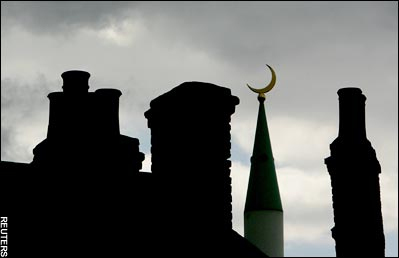 A growing number of people fear that the country faces "a Muslim problem" and more than half of the respondents to the YouGov survey said that Islam posed a threat to Western liberal democracy.